WALK THROUGH OUR VIRTUAL STORE HERE IN MADISON WISCONSIN! AUTHENTIC OLD WORLD GERMAN SAUSAGE, perfect for Oktoberfest / Octoberfest celebrations, from Our Kitchen to Yours! Over 1,000 Authentic German Foods and Specialty German Meat Products, including Munich Weisswurst, Rouladen, Sauerbraten, Schnitzel and Leberkase, and Hundreds of Wisconsin Cheeses and Imports, available for shipping within the U.S., from the Bavaria Sausage Secure Online Shop! Or Phone: 1-800-733-6695 for details! 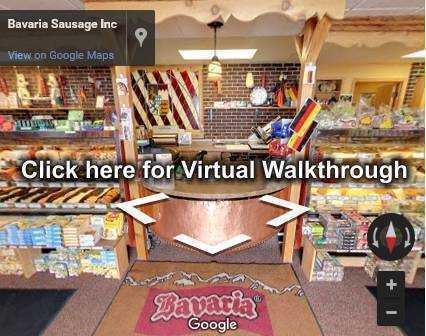 Page Summary: Information about Bavaria Sausage & Cheese Chalet, of Madison, Wisconsin, 53719. 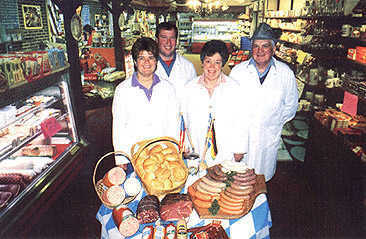 The Bavaria Sausage Kitchen, Inc. has been recognized throughout the Meat Industry for Superior Quality Hand-Crafted Meat Products and are known throughout the country for their High Standards as Producers of Specialty German Summer Sausage, Bratwurst (Weisswurst, Knackwurst, Wieners, Nurnberg & Heidelburg Bratwurst! ), and Landjaeger Snacking Jerky.